SNPs and candidate genes associated with bacterial wilt resistance in Italian ryegrass were identified by sequencing the parental plants and pooled F1 progeny of a segregating population. Italian ryegrass (Lolium multiflorum Lam.) is one of the most important forage grass species in temperate regions. Its yield, quality and persistency can significantly be reduced by bacterial wilt, a serious disease caused by Xanthomonas translucens pv. graminis. Although a major QTL for bacterial wilt resistance has previously been reported, detailed knowledge on underlying genes and DNA markers to allow for efficient resistance breeding strategies is currently not available. We used pooled DNA sequencing to characterize a major QTL for bacterial wilt resistance of Italian ryegrass and to develop inexpensive sequence-based markers to efficiently target resistance alleles for marker-assisted recurrent selection. From the mapping population segregating for the QTL, DNA of 44 of the most resistant and 44 of the most susceptible F1 individuals was pooled and sequenced using the Illumina HiSeq 2000 platform. Allele frequencies of 18 × 106 single nucleotide polymorphisms (SNP) were determined in the resistant and susceptible pool. A total of 271 SNPs on 140 scaffold sequences of the reference parental genome showed significantly different allele frequencies in both pools. We converted 44 selected SNPs to KASP™ markers, genetically mapped these proximal to the major QTL and thus validated their association with bacterial wilt resistance. This study highlights the power of pooled DNA sequencing to efficiently target binary traits in biparental mapping populations. It delivers genome sequence data, SNP markers and potential candidate genes which will allow to implement marker-assisted strategies to fix bacterial wilt resistance in outcrossing breeding populations of Italian ryegrass. The online version of this article ( https://doi.org/10.1007/s00122-018-3250-z) contains supplementary material, which is available to authorized users. High-yielding forage grasses are major components of temperate grasslands worldwide, providing an important feed source for sustainable ruminant livestock production (Humphreys et al. 2010). Italian ryegrass (Lolium multiflorum Lam.) is one of the most important forage grasses, mainly used for hay and silage production and particularly valued for its high palatability and biomass yield (Bernard et al. 2002). Biomass yield of Italian ryegrass can be severely reduced by various bacterial and fungal pathogens. The most important bacterial pathogen of Italian ryegrass is Xanthomonas translucens pv. graminis (Xtg), which causes bacterial wilt on a range of forage grass species including ryegrasses and fescues (Egli et al. 1975). Yield losses are reported to range between 20% in field swards (Schmidt and Nuesch 1980) and up to 80% in experimental setups after leaf inoculation (Wang and Sletten 1995). Xtg is a gram-negative bacterium of the genus Xanthomonas, which harbors other economically important pathogens such as X. oryzae pv. oryzae (Xoo) causing blight in rice (Duku et al. 2016) and X. campestris pv. campestris (Pammel) Dowson causing black rot in cruciferous vegetables (Singh et al. 2011). In contrast to fungal pathogens, which reproduce mainly on the plant’s surface, Xtg enters its host via wounds or leaf stomata, multiplies in the xylem (Chan and Goodwin 1999) and is transmitted by contaminated mowing equipment (Schmidt 1988). As a bacterial disease, chemical protection against Xtg is difficult and would involve the application of antibiotics which is not tolerated in grasslands and bears the risk of resistance formation (Tancos et al. 2015). Therefore, breeding for resistant cultivars is the only ecologically and economically feasible method to control the disease. This makes resistance against Xtg to one of the major breeding goals in Italian ryegrass. Breeding strategies to improve Xtg resistance are based on the selection of parental plants displaying various sources of resistance against Xtg using artificial inoculation (Boller and Lehmann 1996). This resistance screening is time- and resources-consuming. A marker-assisted selection (MAS) strategy may not only allow for shorter selection time, but also it has the additional advantage to distinguish plants homo- or heterozygous for the resistance allele. This is of particular interest for allogamous species such as Italian ryegrass, which are mainly bred as populations (Posselt 2010). Due to the high level of heterozygosity, dominant resistance alleles may mask the presence of susceptibility alleles, which are therefore maintained in phenotypically selected breeding populations. Upon recombination, homozygosity of susceptibility alleles can occur and cause the emergence of susceptible plants, even in advanced breeding cycles (Acquaah 2012; Michel 2001). A better understanding of the genetic basis governing the resistance mechanism and the host–pathogen interaction is required to establish efficient MAS-based resistance breeding strategies. Generally, plant immune systems are based on two response layers and can be described by the zig-zag-model (Jones and Dangl 2006). The first layer, pathogen-associated molecular pattern (PAMP) triggered immunity (PTI), is based on the detection of pathogens at the plant’s surface by pathogen recognition receptors (PRRs). If the pathogen is able to overcome this defense layer by introducing effector molecules into the plant cell, often via the type III secretion system, the pathogen is able to infect the plant leading to effector-triggered susceptibility (ETS; Pavan et al. 2009). As this arm race continues, plants can detect these effectors with resistance (R) genes and launch a strong defense reaction upon recognition, i.e., effector-triggered immunity (ETI). The fact that on average about 2% of the annotated genes in plant genomes encode for R genes and that these genes are often arranged in clusters, facilitating the inheritance of the whole set, emphasizes the importance of these genes (Sekhwal et al. 2015). So far, resistance genes against Xanthomonas spp. have been identified in various crop species. For example in rice (Oryza sativa L.), seven major resistance genes against Xoo (Xa1, Xa3/Xa26, xa5, xa13, Xa21, xa25, Xa27) have been characterized (reviewed in Zhang and Wang 2013). The gene Xa21 is a typical R gene, encoding for a receptor kinase-like protein, with a leucine-rich repeat motif and a serine–threonine kinase-like domain (Song et al. 1995). Interestingly, Xa21 has also been shown to act as a pattern recognition receptor for the PAMP effector Ax21 (reviewed in Liu et al. 2013). The recessive R gene xa25 encodes for OsSWEET13 (Sugars Will Eventually be Exported Transporters), interacts with the transcription activator-like (TAL) effector PthXo1 and is therefore a typical example for ETI (Chen 2014). In pepper (Capsicum spp.) and tomato (Solanum lycopersicum L.), four different Xanthomonas spp. were identified causing bacterial spot symptoms, X. vesicatoria, X. euvesicatoria, X. perforans and X. gardneri (Stall et al. 2009). A number of different resistance genes and their corresponding effectors were described for that pathosystem (Stall et al. 2009). A first step toward understanding bacterial wilt resistance in Italian ryegrass was the development of a biparental mapping population (hereafter referred to as Xtg-ART), segregating for a major resistance source (Studer et al. 2006). With that population, a genetic linkage map comprising 367 AFLP and 51 SSR markers on seven linkage groups (LGs) was established and used for QTL mapping. A major QTL explaining up to 84% of the observed phenotypic variation was identified on LG 4. 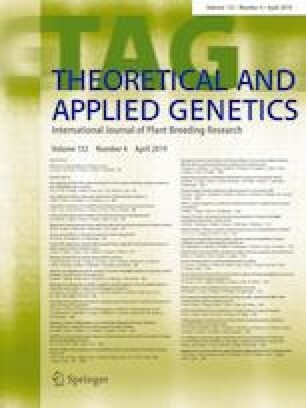 However, further characterization of the QTL and the development of closely linked markers to be used in breeding programs were hindered by the predominantly anonymous AFLP markers associated with the resistance and the limited genome sequence information available for Italian ryegrass at the time. Recently, a draft genome sequence of Italian ryegrass has been established by shotgun sequencing of the resistant parental plant of the Xtg-ART mapping population, consisting of 5.74E + 08 bp in 129,579 scaffolds (N50 4949 bp), corresponding to a 28 X coverage (Knorst et al. 2018). Although this draft assembly of the low-copy fraction of the genome is still very fragmented, it provides an excellent basis for marker development to further uncover the major QTL on LG 4. Bulked segregant analysis (BSA) using high-coverage DNA sequencing and subsequent SNP allele frequency analysis provide an efficient tool to screen a large number of plants to identify SNPs associated with the trait under study (Michelmore et al. 1991; Schneeberger 2014; Zou et al. 2016). 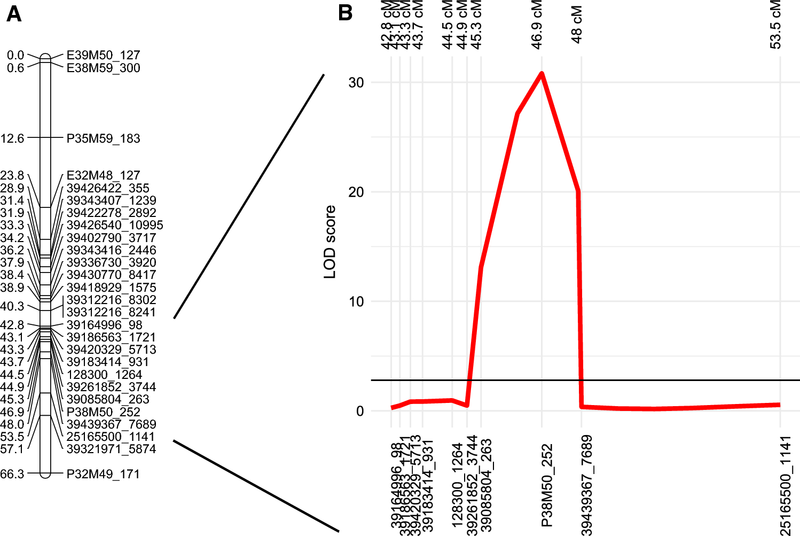 The main objective of this study was to characterize a previously reported major QTL for bacterial wilt resistance on LG 4 in Italian ryegrass by next-generation sequencing (NGS) and BSA using the biparental mapping population Xtg-ART. Specifically, we aimed at (i) providing sequence information of the parental plants of Xtg-ART and their most resistant and susceptible offspring, (ii) identifying SNP markers co-segregating with Xtg resistance and (iii) using these SNPs for the identification of candidate genes underlying the Xtg resistance in Italian ryegrass and to provide an inexpensive marker system for deployment in resistance breeding. DNA from the parental and offspring plants of the biparental mapping population Xtg-ART, developed for characterization of bacterial wilt resistance in Italian ryegrass (Studer et al. 2006), was extracted using the DNeasy plant 96 kit (Qiagen, Hilden, Germany). DNA quality was assessed by agarose gel electrophoresis and quantified through spectrophotometry (NanoDrop; Thermo Fisher Scientific, Waltham, Massachusetts, USA). To complement the already described draft genome sequence of the resistant Xtg-ART parent M2289 (Knorst et al. 2018), the genome of the susceptible Xtg-ART parent Adret2 was sequenced de novo on the Illumina HiSeq 2000 platform (Illumina Inc., San Diego, USA) using 100 bp paired-end reads of fragment libraries with insert sizes of 300 and 800 bp. ABySS (Version: 1.3.5; Simpson et al. 2009) was used for sequence assembly with a k-mer size of 55 bp, raw data from sequencing of both libraries (300 and 800 bp), a minimum base quality of 30 and a minimum contig size of 300 bp to build scaffolds with data from the larger insert library. To get a quantitative measure of the completeness of the gene space, the Benchmarking Universal Single-Copy Orthologues (BUSCO, V3) gene set with the Embryophyta odb9 lineage was searched, using the following specifications: creation date 2016-02-13, number of species 30 and number of BUSCOS 1440 (Simão et al. 2015). F1 individuals of Xtg-ART were classified as susceptible or resistant based on the disease scores reported by Studer et al. (2006) and obtained in the field or in the glasshouse using the isolate Xtg29. 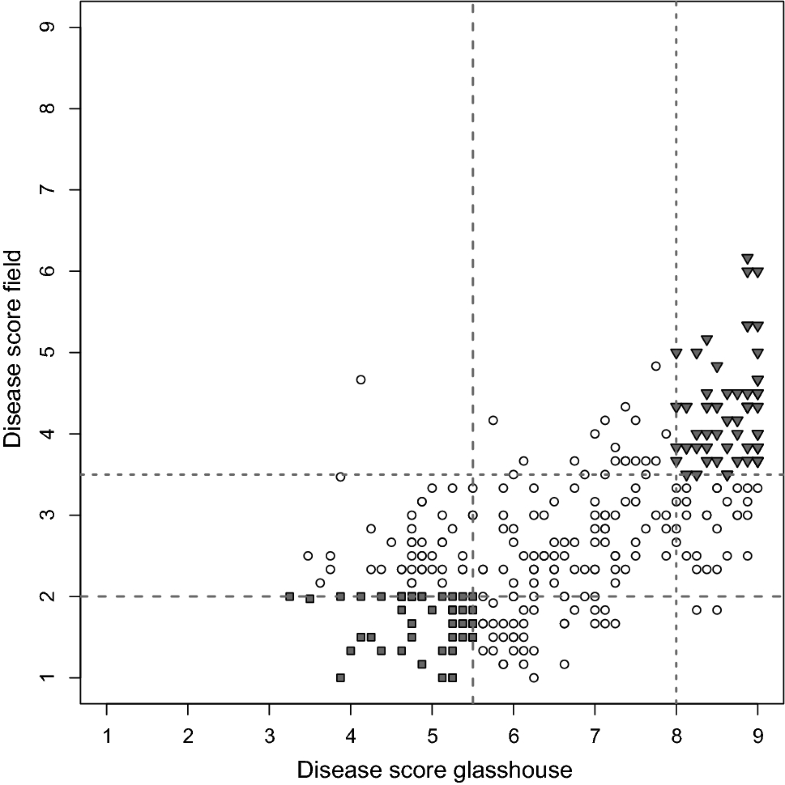 For classification, the upper and lower quartiles of the scores obtained in both experiments (corresponding to disease scores of 8.0 and 5.5 in the glasshouse and 3.5 and 2.0 in the field) were used (Fig. 1). Based on availability and disease scores, 44 susceptible and 44 resistant individuals were selected for DNA extraction and 0.45 µg of DNA from each individual was pooled to form the susceptible and the resistant pool, respectively. Sequencing libraries were prepared using the NEBNext DNA sample kit (New England Biolabs, Ipswich, Massachusetts, USA) with Illumina adaptors according to the NEBNext instructions. Both pools were sequenced with 100 bp paired-end reads on the Illumina HiSeq 2000 platform (Illumina Inc., San Diego, USA). To identify SNPs segregating in the Xtg-ART mapping population (hereafter referred to as “SegSNPs”), raw sequencing reads of the susceptible (Adret2) and the resistant parental plant (M2289) were realigned to the M2289 de novo assembly, which is currently the only publicly available reference assembly of Italian ryegrass (Knorst et al. 2018). Genotypes in each sample were called using a minimum Genotype Quality (GQ) threshold of 30 (Phred scale); below, data points were recorded as missing. SNPs were identified and filtered to only include (i) those heterozygous in at least one parental genotype, (ii) biallelic SNPs and (iii) those with a minimum mapping quality of 30 (Phred scale), using the UnifiedGenotyper of the Genome Analysis Tool Kit (GATK, Broad Institute, Cambridge, MA, USA). Sequencing reads from each of the two pools were realigned to the M2289 de novo assembly (Knorst et al. 2018) using the Burrows–Wheeler Aligner (BWA; Li and Durbin 2009) and only those sites that were previously identified as ‘SegSNPs’ and contained a minimum of 20 reads per pool were selected. At each position, SNP allele frequencies were analyzed using fixation index (FST) values, calculated with PoPoolation (Kofler et al. 2011). Genome scaffolds of the resistant parental plant M2289 containing at least one SNP with a FST value of ≥ 0.9 were selected and compared to the synteny-based draft genome assembly of perennial ryegrass (Byrne et al. 2015) by BLAST analysis. The genome position of the corresponding perennial ryegrass scaffolds was determined using the perennial ryegrass GenomeZipper (Pfeifer et al. 2013). SNPs identified as putatively associated with disease resistance above were selected for conversion to competitive allele specific PCR (KASP™) assays followed by validation via genetic mapping within the Xtg-ART mapping population. A total of 221 F1 individuals from the Xtg-ART mapping population were genotyped with the newly developed KASP™ markers (LGC Genomics Ltd., Hertfordshire, UK). Single-marker linear regression using individual marker scores and the phenotypic data from the glasshouse and two field seasons reported by Studer et al. (2006) were used to validate the association of individual markers with bacterial wilt resistance. For this, markers were coded either 1 (homozygous reference allele of the KASP™ assay), 2 (heterozygous reference/variant allele) or 3 (homozygous variant allele) and R2 and P values (not corrected for multiple testing) were reported. Statistical analyses were performed using the R software environment (R Core Team 2018). KASP™ data were recoded for import into JoinMap 4.1 (Van Ooijen and Voorrips 2001) and used to calculate the location of the SNP markers and the corresponding M2289 scaffolds in the region of the major QTL on LG 4. In order to consolidate marker positions relative to the QTL, six AFLP markers flanking (E39M50_127, E38M59_300, P35M59_183, E32M48_127, P32M49_171) or co-locating (P38M50_252) with the major QTL in the original study (Studer et al. 2006) were included in map calculation with their original genotyping data. Kosambi’s mapping function for regression mapping was used to calculate the maps. Maps for the two parental genotypes were calculated separately and combined using marker located on both maps. For QTL analysis, the MQM algorithm of MapQTL6 was used (Van Ooijen 2009). Cofactors were selected with the function “Automatic Cofactor Selection”. The thresholds for significant correlation between marker and the disease resistance trait were calculated with a permutation test using 5000 iterations. To simulate the potential success of MAS, KASP markers with a R2 values ≥ 0.2 from single-marker regression and mapping to LG 4 were selected. For each marker or combinations of two or three markers, mean disease scores obtained in the glasshouse for individuals homozygous for the allele(s) associated with resistance (positive selection) and for individuals homozygous for the alternative allele(s) (negative selection) were calculated and compared to the mean values of the entire mapping population. For a comprehensive overview of the genome constitution in the parental plants of Xtg-ART, a de novo assembly of the susceptible parental plant Adret2 was produced and compared to the recently established draft genome sequence of the resistant parental plant M2289 (Knorst et al. 2018). The sequencing of Adret2 resulted in 6.93E + 08 100 bp Illumina reads, which were filtered and assembled into 117,277 scaffolds with a minimum size of 2 kb. The total assembly size was 5.07E + 08 bp with an N50 value of 4760 bp (Table 1). To assess the completeness of the gene space in the Adret2 de novo assembly, a BUSCO analysis using the Embryophyta lineage was performed (Simão et al. 2015). In total, 1440 BUSCO groups were searched and 75.5% were found to be complete in the Adret2 assembly, whereas 13.9% were recorded as missing (Table 2). Although the de novo assembly of M2289 had a slightly higher number of complete BUSCOs and a lower number of missing BUSCOs (80.5% and 11.0% compared to 75.5% and 13.9% in Adret2, respectively), both assemblies provide a solid basis for SNP discovery in the Xtg-ART mapping population. To identify SNPs segregating in the Xtg-ART mapping population (SegSNPs), the sequencing reads of M2289 and Adred2 were realigned to the more comprehensive assembly of M2289. In total, 18E + 06 SNPs heterozygous in at least one parent were extracted for further analysis. Sequencing of the susceptible and resistant pools consisting of 44 F1 individuals each resulted in 1.55E + 08 and 1.53E + 08 100 bp reads, respectively. Reads from both pools were separately realigned to the M2289 de novo assembly and SNPs segregating in the population, as determined in the parental plants above, were extracted. A total of 12E + 06 of the previously identified SegSNPs (66%) had coverage with more than 20 reads per site and per pool. FST values of these SNPs were calculated and 271 SNPs on 140 different scaffolds exceeded an FST value of 0.9 (Supplementary Table 1), thereby being putatively associated with bacterial wilt resistance. Of the 271 SNPs identified on 140 scaffolds, 30 SNPs on 29 scaffolds were selected for genotyping based on their putative assignment to LG 4 inferred by synteny with the draft genome assembly of perennial ryegrass (Byrne et al. 2015). These SNPs were genotyped in 221 F1 individuals of the Xtg-ART population using the KASP™ SNP genotyping technology. By single-marker linear regression analysis, 15 SNPs with R2 ≥ 0.2 for all the three disease score measurements reported in Studer et al. (2006) were identified, highlighting the association of these markers with bacterial wilt resistance (Table 3). SNP marker 39312216_8241 explained the largest proportion of variance for resistance in the glasshouse with R2 = 0.41, followed by SNP 39336730_3920 (R2 = 0.39). Together with eight additional markers, 13 out of these 15 SNPs mapped to a 28 cM interval on LG 4 of the Xtg-ART population, spanning the QTL region flanked by AFLP markers E32M48_127 and P32M49_171 (Studer et al. 2006; Fig. 2a). Association of these SNP markers with bacterial wilt resistance was further validated using QTL analysis and the disease scores from the previously reported glasshouse experiment (Studer et al. 2006). The major QTL for bacterial wilt resistance was located between 45 and 48 cM (Fig. 2b), with a maximum logarithm of odds (LOD) score of 30.8 at the location of the AFLP marker P38M50_252, while the SNP marker 39085804_263 was located 1.6 cM from the QTL peak. Another flanking marker, SNP 39439367_7689, failed to meet the LOD threshold but was located 1.1 cM from the QTL and had a highly significant association with resistance in the single-marker regression (R2 = 0.34; Table 3). In order to simulate MAS markers with R2 > 0.2 in single-marker regression (Table 3) and mapping to LG 4 (Fig. 2) were selected. Positive single-marker MAS reduced the average disease score by up to 17% (marker 39439367_7689) when compared to the control without MAS (Table 4). Negative selection for the same marker increased the average disease score by 14% when compared to the control. Positive selection for combinations of two or three markers resulted in a decrease in the average disease score of up to 28% (markers 39430770_8417 & 39439367_7689) or 36% (markers 128300_1264 39430770_8417 & 39439367_7689), respectively, when compared to the no MAS control (Table 4). The 21 SNP markers mapping to LG 4 of Xtg-ART contained candidate genes for disease resistance. Of special interest were a gene for a CRINKLY4-related protein on scaffold 39312216, a gene coding for a nodulin MtN3 family protein (SWEET17) on scaffold 39426422, the BAK1-interacting receptor-like kinase 1 on scaffold 39343416, the cysteine-rich RLK (RECEPTOR-like protein kinase) 26 on scaffold 25165500 and the disease resistance protein (TIR-NBS-LRR class) on scaffold 39402790 (Table 3). Three of these four scaffolds contain more than one SNP with an FST value ≥ 0.9 in close proximity, stressing the potential importance of these scaffolds region (Supplementary Table 1). In addition, for two of the four scaffolds, SNP markers highly associated with bacterial wilt resistance were identified through single-marker regression (Table 3). Here, we demonstrate the efficacy of NGS-based pooled DNA sequencing to enrich with sequence information a previously identified QTL region harboring an important source of bacterial wilt resistance in Italian ryegrass. The sequence information was utilized to develop and validate an inexpensive marker system that can now be used to fix resistance alleles in genetically heterogeneous breeding populations. Implementation of more efficient MAS-based breeding strategies to develop cultivars resistant to bacterial wilt is an important goal in one of the most important forage grass species worldwide. Furthermore, the candidate genes identified here provide interesting targets for further research, to increase the understanding of the complex interaction of Xtg and Italian ryegrass. A major limitation in the development of MAS-based breeding strategies in forage grasses is the still rather limited availability of genomic sequence information and genome-wide marker resources. This is particularly true for allogamous and highly heterozygous forage grass species such as Italian ryegrass, which are characterized by large, highly complex and repetitive genomes (Byrne et al. 2015; Kopecky et al. 2006). While intensive sequencing efforts in perennial ryegrass (L. perenne) have led to the availability of a draft genome sequence (Byrne et al. 2015), such a resource has only recently become available for Italian ryegrass (Knorst et al. 2018). In the present study, this resource was complemented by a draft genome assembly of the susceptible parental plant (Adret2) of the Xtg-ART mapping population, where a large QTL accounting for up to 84% of the phenotypic variance for bacterial wilt resistance was previously identified (Studer et al. 2006). Although the two parental genomes of Xtg-ART are far from being complete, BUSCO values of more than 75% proved sufficient to give a first overview of the genome composition of the susceptible and resistant parent of this mapping family and, more importantly, to efficiently preselect a high number of SNPs segregating in the offspring. Based on the sequence data presented here, SNP calling produced about 1.8E + 07 SNPs being heterozygous in at least one parental plant. With an estimated assembly size of 5.74 × 10E + 08 bp, this corresponded to an average SNP density of 3.1 SNPs/100 bp of the assembly. This is in line with a previous study in perennial ryegrass, where 3.56 SNPs/100 bp in genic regions of perennial ryegrass were reported (Ruttink et al. 2015). In addition to the use in Xtg-ART, the sequence resources presented constitute an important source for genome-wide marker analysis in other Italian ryegrass genotypes and cultivars and will advance large-scale identification of species-specific SNPs in the Festuca–Lolium species complex (Birrer et al. 2014; Liu et al. 2018; Stočes et al. 2016). BSA to link DNA markers to a trait of interest was first proposed in 1991 (Michelmore et al.) and has since been applied in forage grasses to determine linkage of the leafy head (ldh 1) mutation to AFLP markers in Italian ryegrass (Gao et al. 2002), to identify SSR or AFLP markers associated with resistance to crown rust (Puccinia coronata f. sp lolii) in perennial ryegrass (Dumsday et al. 2003; Fujimori et al. 2004; Muylle et al. 2005), to link EST-derived CAPS and AFLP markers to a gene conferring resistance to ryegrass blast caused by Pyricularia spp. (Miura et al. 2005) or to identify a novel major locus for gray leaf spot (Magnaporthe oryzae) resistance in Italian ryegrass (Takahashi et al. 2014). BSA has been shown to work best for traits controlled by a single locus or gene, causing a distinct phenotype that allows a correct pool assignment. An additional important success factor for BSA is a sufficiently high number of markers that are evenly distributed in the genome (Magwene et al. 2011). While in the above-mentioned studies a relatively low number of markers were used, more recently massive analysis of cDNA ends (MACE) allowed to identify a candidate gene for the LpPg1 stem rust resistance in perennial ryegrass (Bojahr et al. 2016). A total of 145,707 SNPs identified between the pools of 20 resistant and 20 susceptible individuals provided a rich source of candidate SNPs co-segregating with stem rust resistance. Although the genetic resolution determined by recombination events around the causative gene in a total of 40 individuals was very limited, using a population of 276 individuals allowed mapping of 30 candidate transcripts to a segment of 50.8 cM, with the most closely linked markers surrounding the LpPg1 locus at distances of 1.1 and 0.3 cM, respectively. In the present study, we used whole genome sequencing of both pools to generate marker data at a very high density, even after filtering for SNPs that were heterozygous in at least one parental plant. Constructing the susceptible and the resistant pool with 44 individuals each enabled us to identify SNPs putatively associated with the major QTL for bacterial wilt resistance in Xtg-ART. We successfully converted 30 SNPs from 29 scaffolds to KASP™ markers and genetically mapped them using 221 Xtg-ART individuals. Strikingly, 21 of the selected SNP markers mapped within the interval spanned by the AFLP markers previously flanking the QTL region, clustering around the QTL peak at marker P38M50_252 (Studer et al. 2006). Furthermore, most of the 21 SNPs were significantly associated with bacterial wilt resistance, explaining up to 41% of the variance observed based on single-marker linear regression (Table 3). Thus, BSA was very efficient to identify trait-associated SNPs and enrich the target region with genomic sequence information. Given the relatively low number of individuals in both pools as well as the moderate number of individuals used for mapping and QTL analysis, we did not achieve a genetic resolution sufficiently high to pinpoint the causative gene conferring bacterial wilt resistance. However, we identified a set of biologically interesting candidate genes that can now be further analyzed in the genome of the susceptible and resistant parental plants of Xtg-ART. More importantly, the primary goal of this work was to develop molecular markers flanking the QTL for deployment in marker-assisted breeding strategies. Initial work to map the QTL in this population used AFLP markers, which are anonymous, dominant and not ideal for high-throughput analysis. Our approach enabled us to enrich the target QTL with sequence information, which could then be used to design KASP™ markers and select those flanking the QTL for breeding applications. KASP™ markers are ideal for breeding applications as they are inexpensive and amenable to high-throughput analysis (Semagn et al. 2014). KASP™-based assays have, for example, been used to develop breeder-friendly marker solutions for wheat leaf rust resistance (Neelam et al. 2013) or to accelerate public sector rice breeding (Steele et al. 2018). The KASP™ markers developed in this study have not only been shown to be significantly associated with bacterial wilt resistance (Table 3), and some of them also flank the QTL region previously identified (Fig. 2). Such markers may be particularly valuable for marker-assisted backcrossing (MAB; Frisch and Melchinger 2005) or marker-assisted recurrent selection (MARS; Bernardo and Charcosset 2006) to accelerate breeding for bacterial wilt resistance in ryegrasses. MAB has been shown to be particularly efficient in self-pollinating species such as rice where a large number of traits have been successfully introduced into elite germplasm using markers with varying levels of linkage to the target region (reviewed in Hasan et al. 2015). Ryegrasses are cross-pollinated species, usually bred as synthetic varieties based on multiparental crosses or improved as populations (Posselt 2010). In such species, MARS may be particularly valuable for population improvement using one or several cycles of a combination of marker-based and phenotypic selection (Bernardo and Charcosset 2006). In Italian ryegrass, a single SSR marker linked to crown rust resistance has been shown to considerably improve selection efficiency when compared to pure phenotypic selection (Kölliker et al. 2016). In the present study, simulation of MAS within the same dataset, where the markers were identified in, showed the potential of increasing resistance in the population by selecting for resistance alleles using single markers or combinations of two or three markers (Table 4). Due to the limited population size, individuals homozygous for resistance alleles at three-marker loci were rather scarce. However, twenty individuals homozygous for resistance alleles were identified for the combination of markers 128300_1264, 39312216_8302, 39439367_7689 and average disease score among these individuals was with 5.08 considerably lower when compared to the mean of the entire population (6.61; Table 4). Thus, the markers identified have a high potential for application of MAS in resistance breeding programs, but they need to be validated in different genetic backgrounds. Among the scaffolds mapping to the QTL region, a number of interesting candidate genes were found. On scaffold 39312216, for example, a gene for CRINKLY4 (serine/threonine protein kinase-like protein CCR4)-related protein was identified. A CRINKLY4-related kinase was found to be upregulated in Brassica napus after infection with Sclerotinia sclerotiorum and functioned as a pathogen recognition receptor (PRR) leading to pathogen-associated molecular pattern (PAMP) triggered immunity (PTI) after pathogen detection (Wu et al. 2016). Thus, in the Xtg-Italian ryegrass interaction, CRINKLY4 might be involved in the detection of Xtg and the initiation of PTI. A gene coding for a nodulin MtN3 family protein, also known as SWEET17 (Chardon et al. 2013), was annotated for scaffold 3942642. In rice, SWEET13 encodes for xa25 and confers resistance against X. oryzae pv. oryzae (Xoo; Cheng et al. 2017). SWEET transporters seem to be a target of vascular pathogens to allocate sugars to promote their growth (Chen 2014). As Xtg is a vascular pathogen primarily invading the xylem of the host plant (Masuch et al. 1989), sugars might be transported into the apoplast as an energy source for Xtg and a mutation in the sugar transporter may lead to plant resistance based on the limited availability of energy. However, in rice, Xoo activates SWEET via TALEs (transcription activator-like effectors) which are missing in Xtg (Wichmann et al. 2013). Scaffold 39343416 encoded for the protein BAK1 (BRI1 [Brassinosteroid Insensitive 1]-associated kinase-interacting receptor-like kinase 1). BAK1 is involved in PTI and forms a heterodimer with FLS2 (flagellin sensing 2) after recognition of the bacterial derived PAMP flg22 (Chinchilla et al. 2007; Schulze et al. 2010). Another scaffold, 39420287, carrying two SNPs with FST values of 0.96 and 0.97, encodes for a transthyretin-like protein which is a potential substrate for BRI1 (Nam and Li 2004). This suggests that there is a similar recognition mode of Xtg by Italian ryegrass as it is known for A. thaliana and the detection of a conserved region of the bacterial flagellum, flg22 (Chinchilla et al. 2006). However, the Xtg strains sequenced so far all lack the flagellar gene cluster (Hersemann et al. 2017). Thus, these observed candidate genes may present remainders from the arms race between host and pathogen, and the genes for recognition might still be present in Italian ryegrass as part of a cluster of resistance genes (Sekhwal et al. 2015). Other candidate genes identified included a cysteine-rich RLK (RECEPTOR-like protein kinase) 26 known to be induced after pathogen attack (scaffold 25165500; Chen et al. 2004) or a disease resistance protein (TIR-NBS-LRR class) with no reported specific function (scaffold 39402790; Meyers et al. 2003). In summary, the candidate genes identified through BSA and QTL mapping include PRRs involved in PTI as well as classical R genes involved in effector-triggered immunity ETI. In conclusion, we successfully used a combination of genome sequencing and BSA to identify SNP markers associated with Xtg resistance in Italian ryegrass and enrich a major QTL with DNA sequence information. This enabled us to design and validate an inexpensive molecular marker system for use in marker-assisted breeding applications aimed at increasing the frequency of the resistance QTL in breeding populations. We envisage being able to use these markers through marker-assisted recurrent selection and to substantially increase selection efficiency for bacterial wilt resistance in Italian ryegrass. VK obtained and analyzed the data and drafted the manuscript. SB and SY performed genome assembly and annotation and helped drafting the manuscript. TA and BS helped with data analysis and interpretation and improving the manuscript. RK conceived the study, assisted data analysis and interpretation of the results and drafted the manuscript. All authors read and approved the final version of the manuscript. This work was partially financed through Grant No: 31003A_138358 of the Swiss National Science Foundation. We thank Stephan Hentrup, Department of Molecular Biology and Genetics, Center for Quantitative Genetics and Genomics, 4200 Slagelse, Denmark, for technical support. This work was partially financed through Grant No: 31003A_138358 of the Swiss National Science Foundation. The datasets generated during the current study are available in the Zenodo (zenodo.org) repository, DOI: 0.5281/zenodo.1408508.